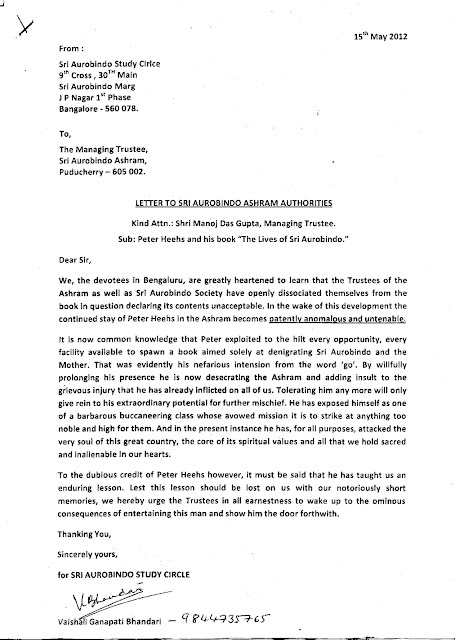 We, the devotees in Bengaluru, are greatly heartened to learn that the Trustees of the Ashram as well as Sri Aurobindo Society have openly dissociated themselves from the book in question declaring its contents unacceptable. In the wake of this development the continued stay of Peter Heehs in the Ashram becomes patentlv anomalous and untenable. It is now common knowledge that Peter exploited to the hilt every opportunity, every facility available to spawn a book aimed solely at denigrating Sri Aurobindo and the Mother. That was evidently his nefarious intension from the word 'go'. By willfully prolonging his presence he is now desecrating the Ashram and adding insult to the grievous injury that he has already inflicted on all of us. Tolerating him any more will only give rein to his extraordinary potential for further mischief. He has exposed himself as one of a barbarous buccaneering class whose avowed mission it is to strike at anything too noble and high for them. And in the present instance he has, for all purposes, attacked the very soul of this great country, the core of its spiritual values and all that we hold sacred and inalienable in our hearts. To the dubious credit of Peter Heehs however, it must be said that he has taught us an enduring lesson. Lest this lesson should be lost on us with our notoriously short memories, we hereby urge the Trustees in all earnestness to wake up to the ominous consequences of entertaining this man and show him the door forthwith. We request the friends at Bangalore to explain the basis of their understanding, whereby they declare "the trustees of the Ashram have OPENLY dissociated themselves from the book in question, declaring the contents unacceptable". Have the trustees of the ashram REALLY said so, in any official document released by them. If yes, kindly share its actual contents, for general information, since the matter is of general interest to many many devotees. "Sri Aurobindo Ashram Trust does not approve and has nothing to do with the book entitled " The Lives of Sri Aurobindo"written by Peter Hees and Sri Aurobindo Ashram Trust is not any way responsible for the contents or the interpretationsof the material contained therein." " Sri Aurobindo Ashram Trust is fully aware of its resonsibilities and its actions are determined keeping in view the vision and values it is meant to uphold." If it is true, certain poits come forward to be answered by the Managing Trustee to the followers and devotees of Sri Aurobindo and the Mother. 1.If they do not approve the book and its contents, then at the initial stage who permitted Peter Hees to publish the book? 2.once Dr. Dillip Dutta, one of the Trustees has favoured the book as good one refering views of twopersons. Is it not contradictory to the present view of M.T.? 3. Drastic actions are being taken against the ashramites who speak against this book and Peter Hees. But as a ashramite why action is not taken against Peter accordingly and why he is favoured by recommending to extend his vissa? It prooves that The ashram Trust is playing the double game which is not at all acceptable.